Portochristo is a small town in the East of Mallorca. It is touristy but much quieter than neighbouring towns. Many people come to Portochristo because of the two famous caves: Coves del Drac (Dragon Caves) and Coves de Hams. There are more tourists at the caves than in Portochristo itself. This is a pity: There are no major sights in Portochristo, but it is a nice, small port town. There is a small and clean beach in the centre. The very helpful tourist information is situated in the port building next to the pier for the execution boats. 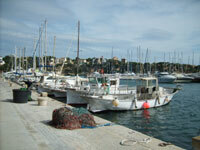 In Portocristo you can see more backpackers than in most other places on Mallorca. 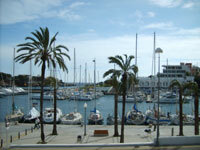 Porto Cristo consists of many narrow streets behind the big port. Here you will find small and cheap restaurants, shops, little pensions and other family businesses. It’s interesting to take a stroll along the small, romantic channel filled with many small boats, which land here. You can watch the fishermen drying there nets and unloading their boats. In Portocristo there are more small boats of the locals and not so many of the big yachts of foreigners like in most other places on Mallorca. Caves near Portocristo: Just before you enter Portocristo coming from Palma de Mallorca there are big signs, which advertise the caves Coves de Hams. But the more interesting caves are the Dragon Caves (Coves de Drac), located a kilometre after driving through Portocristo near the road in direction Porto Colom. The Dragon Caves are very well signposted. The amount of visitors, the parking area and the number of buses in summer are gigantic. For around €8 (2008) you get a guided tour through the caves including the big underground lake. There is a band playing classical music near the lake, which is a bit kitschy. The visit of the Dragon Caves is certainly not uninteresting but it is not a "Must See" in your Mallorca holiday. Many visitors complain about long waiting times, the hype and the show. The tours through he other caves, the Coves de Hams, are similar. The entrance fee is almost the same but the caves itself are less impressing than the dragon caves. 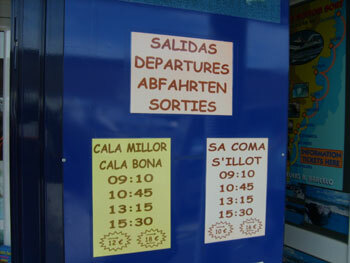 Busses to Portocristo: There are buses about 10 times a day to the mass tourist resort Cala Millor (via S´Illot) and the major district town Manacor (all about €1.50). Direct buses run about 5 times a day to Palma de Mallorca for €6-7. You can do this journey €1-2 cheaper if you take the train to Manacor and get on one of the frequent buses to Portochristo. 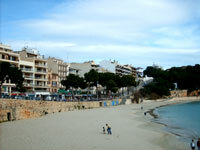 There are also at least 2 buses a day to Cala Ratjada. Most buses also stop at the Dragon Cave. The bus stop in Portocristo is close to the port. Ferries Portocristo: There are tourist boats (with a glass bottom so you can see the fish!) to the nearby holiday resorts Cala Millor and Calas de Mallorca several times a day. Tickets are much more expensive than the bus (more than €10). 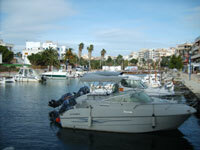 From Cala Millor there are also tours to the caves.